Whether you are testing out San Ramon as a place to live, or simply enjoying it on your eco-friendly vacation, Vista Valverde is a special property with guest houses (our "cabinas") located 4000 ft above the Pacific Ocean in the mountains of San Ramon. With views all the way to the Nicoya Peninsula, Isle Tortuga and beyond, the views of the landscapes change daily as the clouds roll in and out. Our guest homes contain all local woods and local craftsmanship, granite and hand tiling throughout, leather couches and local Sarchi furnishings. Even the clouds can't help but come right in the door from time to time. The construction of the cabinas are completely sound and only a few years old with screens in the upper windows and full walled windows in each room to make the most of the beautiful outdoors and Pacific views. Surrounded by gardens, walkways and sitting areas, as well as your own parking areas and sitting porches of over 500 sq ft., you can also enjoy an open fire in one of our designated area pits with rustic seating. Cook as many meals as you like in your full kitchen with gas stove and all ammenities. Bringing the kids? Walk over to the the main house (where we live with 3 of our own) and enjoy the playsets and toys. DVD library, book library and small applicances are also in the main house for you to borrow during your stay. This listing is for our 1 BR cabin, with therapeutic queen sized bed and full oversized bathtub in your ensuite. Truly relaxing and quiet. For more space, please visit our listing for the 2 BR guesthouse. Come find your pura vida here, at Vista Valverde. David was born and raised just outside the capital here in San Jose, Costa Rica, and spent half of his life as a New Yorker as well. Kim was a New Yorker for most of her life, save a few fun-filled years at the beach in Ocean City, MD. After looking for 10 years for the perfect place to live and raise their children, they stumbled upon San Ramon in Alajuela, Costa Rica. Beautiful weather, stunning views, tico lifestyle but with all the amenities close by, it was the perfect place. And Vista Valverde the perfect business to run from home, gorgeous guest houses, and just the right Pura Vida. With their backgrounds in everything from hospitality to real estate, legal professions to construction, they also run San Ramon's premier real estate company, Paradise Management Realty, to help other folks who want to stay in this wonderful part of the Central Valley! So if you decide you love San Ramon as much as they do, let them help you stay! Just the sense of Peace is endless. Views, space, privacy, comfort, everyone who comes here, no matter their age, leaves feeling refreshed and relaxed. The weather is perfect year round, 75-85 degrees by day, 60s by night. And we are so close to wonderful town of San Ramon, we feel we have it all. And we can host so many different events from weddings (the backdrop is gorgeous) to family reunions and yoga retreats - come enjoy all that there is to do within 1-2 hours drive, or sit and do nothing at all. Your choice, your pura vida. Everything is within driving distance. Arenal is 1.5 hours and so is Monteverde Cloud Forest - or just visit our own Nectandra cloud Forest about 35 minutes down the road. The lovely and fun beach of Dona Ana is less than an hour, or head to the ferry to the North Pacific beaches in an hour. Even the airport is less than an hour's drive, though you would never believe it. If you just want to plop your things down, take days trips or even an overnight here and there - leave your computers and iPads and things in a safe place (all houses have alarm systems), you can do that here. There is something for everyone year round, and special events are only more beautiful with our Pacific Ocean backdrop. Christmas is the whole month of December in Costa Rica, and joyous in the nearby town along with the famous year round open market on the Fridays and Saturdays. Festivals of Palmares and San Ramon are minutes away - check our website calendar for local events. We have in-room massages, yoga instruction upon request, even our own tours if you want to sit back and let us do the driving. Our weather can't be beat and there is no need for a/c or heat - just some big fluffy comforters at night. Come see why so many folks from Brazil to Canada now call this area of Costa Rica their Paradise. toilet, combination tub/shower, Oversized bathtub & shower. Doors off living area & bedroom. Nicely appointed bathroom with oversized bathtub, REAL hot water, a toilet that can flush the paper. Plus nice porcelain tiles and granite counters, hairdryer and soft towels and robes. Shampoo and conditioner supplied, but other toiletries available for purchase at main house. See all surrounding town from our perch - Magallanes, San Ramon, Alfaro - with the lights out to Puntarenas. Beautiful at night. Views of the San Ramon mountains are our backdrop. 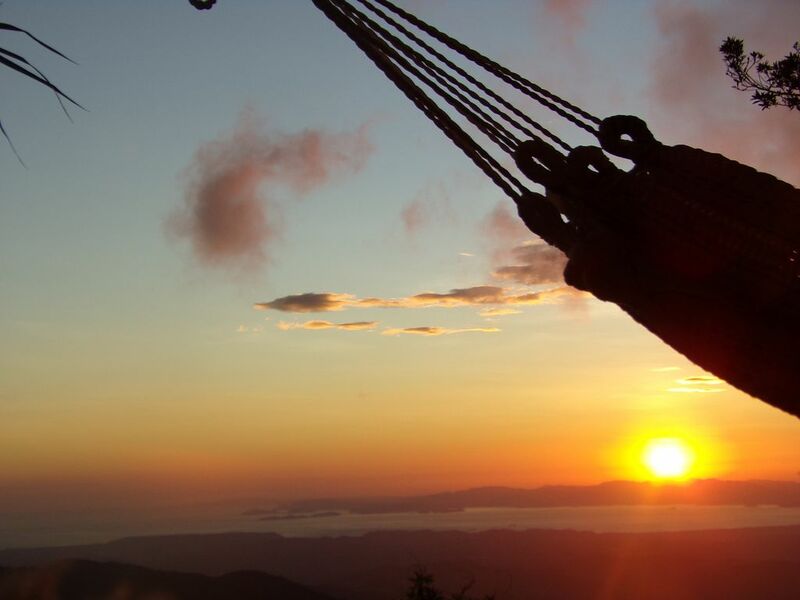 We have gorgeous vistas of Nicoya Peninsula, the islands in the Gulf and the Pacific Ocean. Laundry can be dropped off at main house for $7/load, pick up next day. In cabins, and at El Taller. Internet in mountains can be spotty, but it is always at the El Taller. Outdoor firepits -one on hilltop finca and one at base of cabin. Coffee, sugar, creamer, oil, spices, sometimes even rice and beans! table for 4 in cabins, also breakfast area at main house and party area at main house available for separate rental. At El Taller. Let us know the age and we will have a box of toys waiting in the room. Seasonal kitchen gardens outside cabinas. Fresh fruits in all the trees, help yourself! Huge outdoor patio, covered. Considered part of Living Space here in Costa Rica! Our rentals are versatile - we mostly accommodate long term rentals. Our cabins are little houses, high end finishings and custom built. They each have their own alarm system and someone is almost always on the property to ensure your comfort. No matter how long or short your stay, we know it will be an enjoyable one. We also own Paradise Management Realty, San Ramon. If you are looking to make your stay more permanent - let us know how we can help you stay in Paradise! Wonderfully relaxing spot with an awesome view yet close to town! Vista Valverde is a gorgeous spot with views all the way to the ocean! Our cabin was lovely and a wonderful place to relax. It is only a short trip into the town of San Ramon, making it the perfect location for sightseeing or for house hunting for longer rentals. Kim and David are great hosts, very friendly and helpful, and knowledgeable about the area. Kim cooked us breakfast in the morning and it was delicious! We look forward to being back in the area soon. We are in the center of so many wonderful attractions, volcanos, beaches, forests and mountains. Even our local cloud forests are only 15 - 45 minutes away. Take your adventures without being in the touristy and high traffic areas - Our guests use us as a home base and day trip and even overnight trip (we have alarms on each of our buildngs and somone is ALWAYS watching over the property). We are up a private road, away from it all, overlooking the Pacific, yet just minutes form the large town of San Ramon central. Meals, tours, rental cars, in room massage, private chef - all can be arranged but you must inquire when you make the reservation.